The western side of Guadalupe Street near the University of Texas is a vibrant but jumbled mess of stores, apartments and even churches. There are even sections that look rundown. 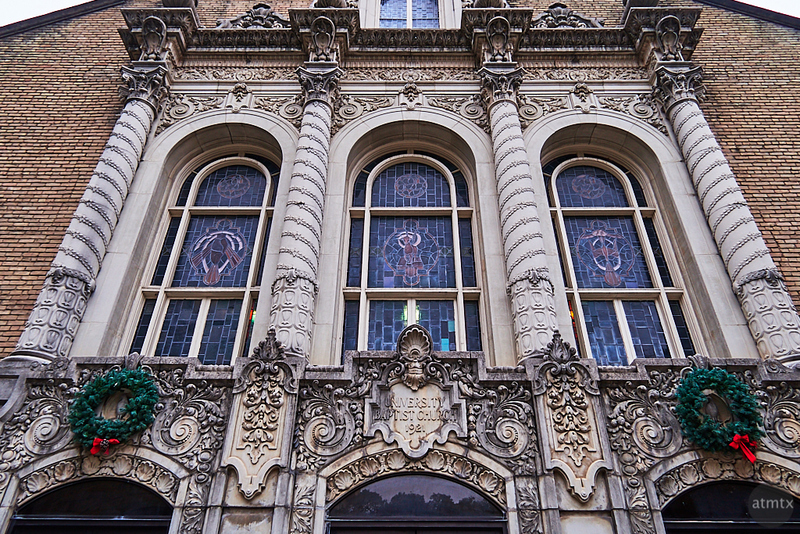 Within this cacophony, I found this wonderfully ornate façade of the University Baptist Church. I’ve been to this area on occasion but this is the first time I really saw these beautiful details. The plaque says 1921. I can’t imagine how different this area must have been back then. Heck, the famous symbol of UT, the tower, was completed in 1937. West of Guadalupe, new blocks of tall private dorms are under construction. While not quite at the pace of downtown, the area around campus now sports multiple new and fancy high-rise dorms. I used my new Canon G7X Mark II to capture this image. This photo at 24mm equivalent seems a bit sharper across the frame than others at the same focal length, retaining a nice level of detail. I also used the native 2×3 aspect ratio, which worked well for this wide shot.